Calling all rock stars to this "WICKED" new music class covering all your favorite songs and artists of the 1990s (think Wilson Phillips, Backstreet Boys, Spice Girls, the Macarena as some examples). Friends and family join us on the last day of class for a rockin' show featuring your adorable children! Teachers - Ms. Chellie-Wed at 10. Ms. Nicole-Tues at 9:30 and Wed at 11. NO CLASS: Wed, April 3 - *MAKE UP CLASS Th, March 6th! 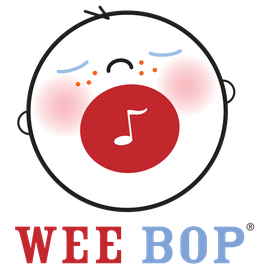 After sampling multiple toddler music classes, I found Wee Bop's to be the most engaging, thoughtful, and responsive to the needs of the children. I love how the teacher let's children explore real instruments, it was so refreshing! We were also pleased that the class was the most affordable of the 4 organizations we were considering! Excite the natural curiosity of these growing kids through the exploration of a wide variety of drums and hand percussion. Your child will have a chance each week to hold and "play" a featured instrument. Join this upbeat class and move, sing and dance to the latest children’s music appealing to both children and adults. Parent/caregiver attends with child. NO CLASS: Mar 4, & Apr 1 and 4 *MAKE UP CLASS Th, March 7th! "The class had a nice flow and your incredible patience and effective communication with the children made it even better. Thanks Ms. Nicole!" The whole family is invited to this music class! Sing, dance, play instruments and with the parachute. It's a fun activity to get the whole gang moving and singing. Sibling 5 months or younger attend for FREE! Dads can rock out with their little ones at this class. Sing, play with the parachute, play drums and other percussion, snuggle and bond with your little ones in the fun class aimed at working dads who want an activity to do with their kiddo on the weekends. Sibling 5 months or younger attend for FREE! "I work during the week and I so enjoy having the opportunity on the weekend to participate with my daughter in an activity where I can watch her develop and grow!"